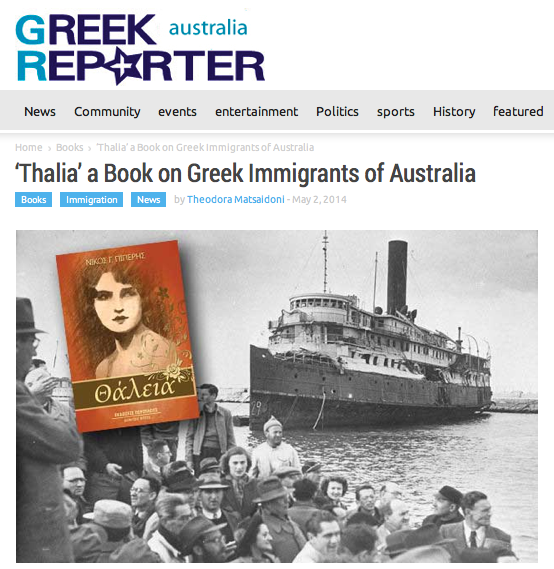 The article 'THALIA' - A BOOK ON GREEK IMMIGRANTS OF AUSTRALIA - was published May 2, 2014 online on the Greek Reporter - Australia, authored by Theodora Matsaldoni. A new book, entitled "Thalia," written by Greek-Australian author Nikos Piperis, talks about one of the most tragic aspects of immigration revealing violent details of young people who were forced to uproot from their homeland against their will. It also shows the true dimensions of the transatlantic journey of the young Greek immigrants who carried their common dreams and hopes with them. The majority of the problems mentioned in this book are common for many people around the world. It is a story of harsh, painful and realistic events. It also refers to the major issues surrounding the children of leftists who were being persecuted due to the political beliefs of their parents after the Greek civil war.